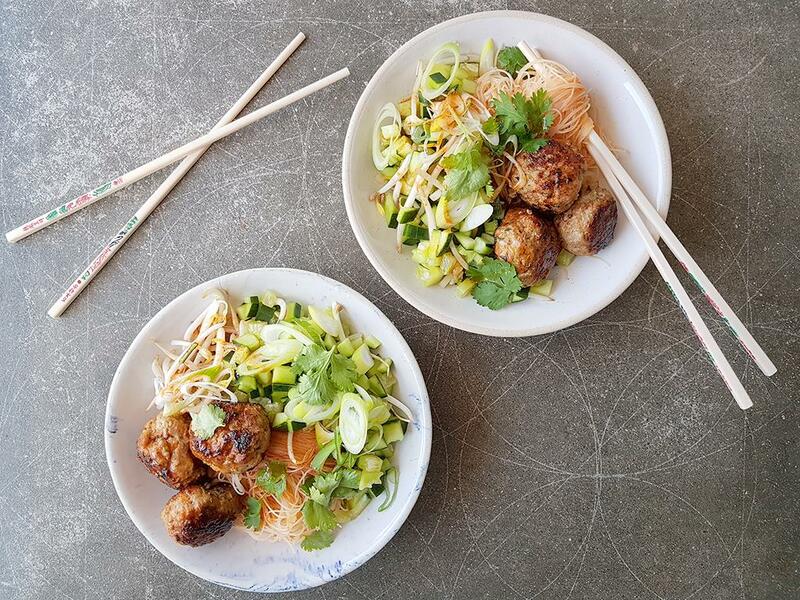 Pork meatballs infused with lime, garlic & ginger & served with a fresh cucumber salad & rice noodles. Lime: Using the fine side of a box grater, grate the peel of the lime to create zest. Then cut in half and juice. 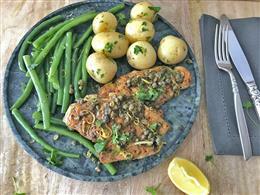 Spring onions: Chop HALF the spring onion slices finely and leave the REST as is. Dipping sauce: Mix together the rice wine vinegar, some of the soy sauce, sriracha, sesame oil and honey. Meatballs: In a bowl, mix together the pork mince, HALF the coriander, CHOPPED spring onions, chilli (if you like a bit of spice), ginger, garlic, lime zest and juice, the REST soy sauce (½ tsp for 1) and fish sauce. Season with salt and pepper and shape the mixture into meatballs (3-4). Set aside. Cucumber salad: Mix together the cucumber, bean sprouts and the REST of the fresh coriander leaves. Rice noodles: Boil the kettle. Place the noodles in a bowl, cover with the boiling water and soak for 1 minute until cooked, but with a slight bite. Drain and mix through HALF the sauce. 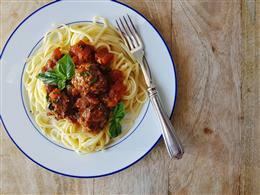 Meatballs: Add a drizzle of olive oil to a pan on medium-high heat. When hot, add the meatballs and cook for 8-10 minutes, until lightly browned and cooked through. Move them around in the pan to make sure they brown evenly. Serve the meatballs with the noodles and cucumber salad on the side. Drizzle over the REST of the sauce.